What words should describe a cemetery? Peaceful, tranquil, protected, dignified, and well-maintained come to mind. We believe these words convey well the feelings and impressions you’ll encounter at all three Lindquist’s Memorial Parks. Each is protected by endowment care trust funds administered by the state of Utah ensuring perpetual care. These sanctuaries complement the same atmosphere and dignity of Lindquist’s seven mortuaries and are managed with the same caring attitude. Each Memorial Day is highlighted with public tributes and flag ceremonies in honor of Veterans. We invite you to visit Lindquist’s Memorial Parks to gain an appreciation for the tranquility maintained as beautiful places to honor your loved ones. Lindquist’s Washington Heights Memorial Park was established in 1947, on the high ground overlooking the adjacent communities of South Ogden and Washington Terrace. Covering nearly 50 acres, Washington Heights is conveniently located in peaceful surroundings and affords quiet dignity for the interment of loved ones and frequent contemplation by family and friends. The cemetery features family estates, a mausoleum, and inviting gardens. 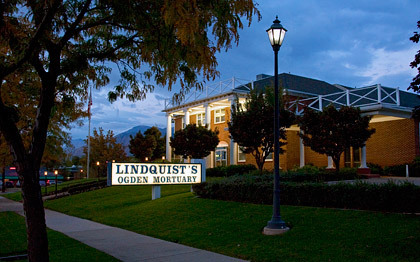 Lindquist’s Memorial Gardens of the Wasatch came under the care and ownership of the Lindquist family in 1967 and is located at the base of imposing Mt. Ogden with views overlooking the Great Salt Lake. A magnificent Italian marble statue of Christ with outstretched arms of welcome stands at the entrance. Ten gardens within the cemetery depict the life and teachings of Jesus Christ including both a Veteran’s section and a beautiful new family estate section. Family estates are constructed with brick walls and include granite benches as well as other unique personalized memorial options. 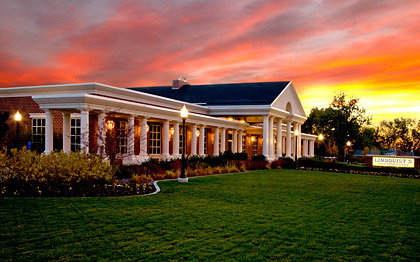 Lindquist’s Memorial Park at Layton was established in 1988 to serve the communities of Davis County. 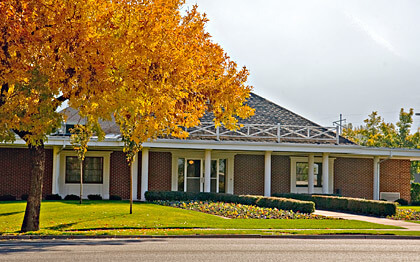 In 1997, the new Lindquist’s Layton Mortuary opened adjacent to the cemetery. Valley View Gardens, for family estates, are located at the cemetery and constructed with brick walls and granite benches. Other unique and personalized memorial options are also available.